We had a week of rain and the garden is going insane, which is just how I love it the most. Saturday I did some work on the bees (Hive A needed to be reduced in size and given some resources, while Hive B needed to calm the hell down and stop growing so much), then Noel mowed the knee-deep lawn. And now we have this lovely scene, where the Mme Alfred Carriere rose is going kind of quietly nuts over in the corner. This is a much better place for this rose than where I had her for years, looming over the pathway. 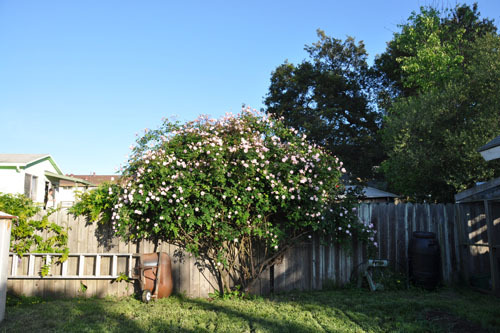 Over the other part of the lawn, the Cecile Brunner rose is lovely as well, 12 feet tall and a little ridiculous, but also amazing. 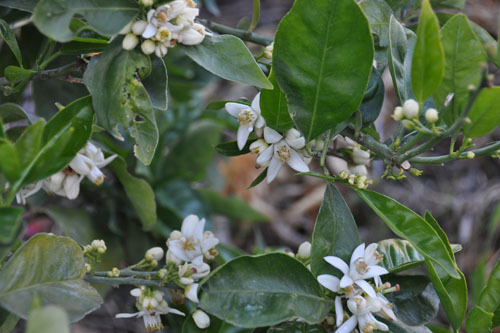 The whole back yard smells lovely right now, because the citrus trees are in bloom. 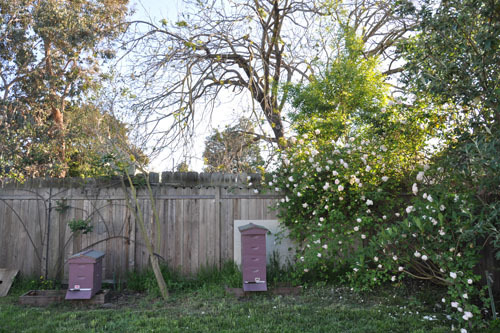 Citrus trees plus bees means citrus honey, yes, but it also means seedy citrus. These are the small prices we pay for the things we love. And fruit season is getting started. The cherries have little cherry babies on them. And I believe we will be getting some apricots this year. 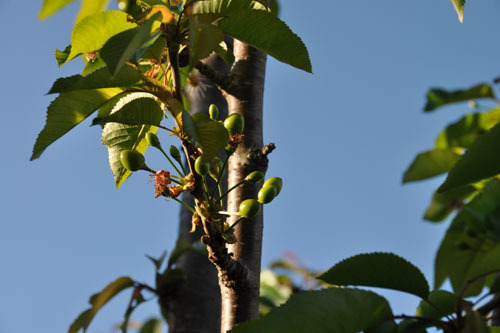 With no Goldie to climb the tree and eat them all I think we have a pretty good chance at fruit. 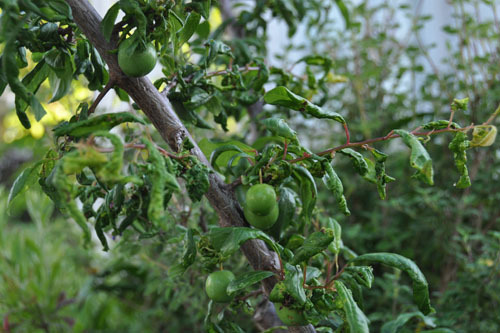 And the little pluot out front, for which I believed I had no pollinator, has fruit all over it as well. 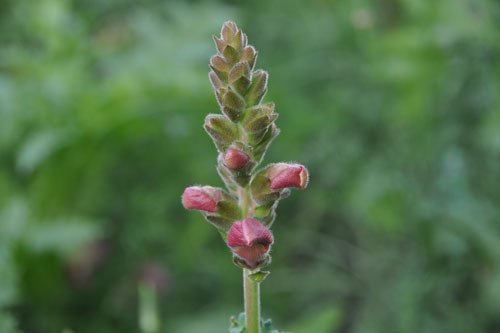 It also has peach leaf curl, which is super-irritating. I am sooo this close to just cutting down the nectarines over this, and now with the pluot? Really. This time of year is the time for potential. 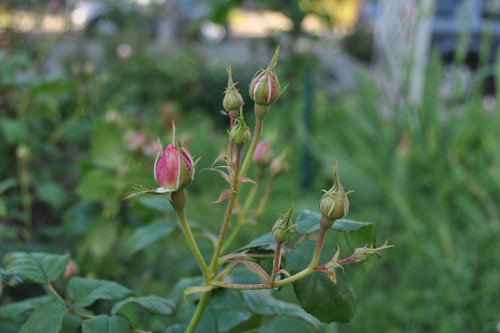 The roses are getting ready to go. Out in the middle of the front garden is are a couple volunteer snapdragons. 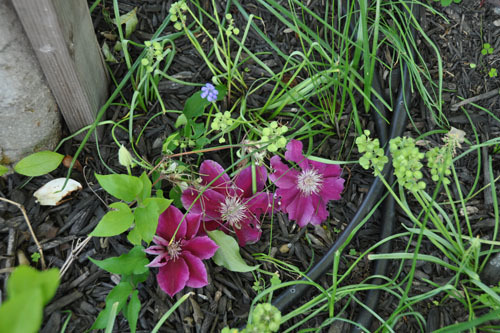 We have finally gotten to the point in the garden where there are lots of volunteers, and all we have to do is weed out the ones we don't want. 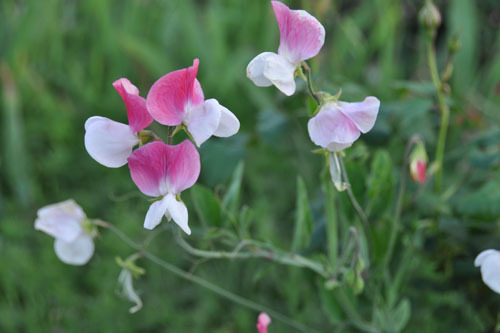 For example, sweet peas just seem to be coming up in all kinds of random places. I haven't planted them in ages but I guess enough seeds got around that they can just keep coming. I suppose it helps that I never weed them out, even when they are in an awkward place. And this. I call it the beach weed, because I picked up a seed pod from a plant on the beach at Cayucos, and because I see it all the time along beaches and waterfronts. I have no idea what it is called though I recall once finding the name on the web. For obvious reasons, searching for "beach weed california" doesn't help much. 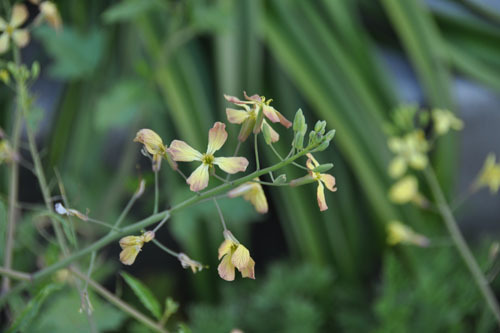 ETA: Thanks to Wendy, I now know this is Raphanus raphanistrum, wild radish. Beach weed comes in a variety of colours, but my favourite is this yellow/mauve combination. Oh! And a couple of years ago I planted a few clematis around to add vertical colour, and they are finally getting of reasonable size. 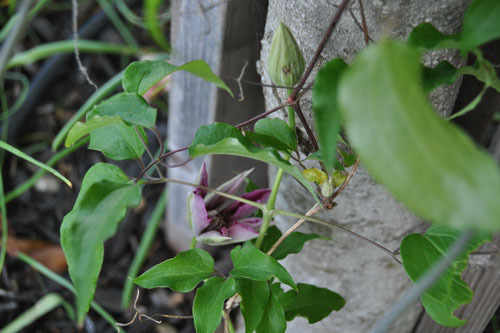 This was the first flower of the season from them, and it's fading a little now, but the vine is making great strides. The one at the base of the magnolia is bigger, with opening blossoms as well. It's in both a deeper and more fertile soil, so that probably helps. 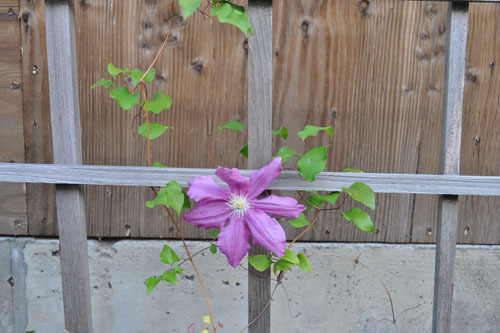 Though for some reason it sent a shoot under some things and produced these three flowers completely in the dark. I saw them one morning while walking around the yard and pulled them free, but this is one plant that needs some training. 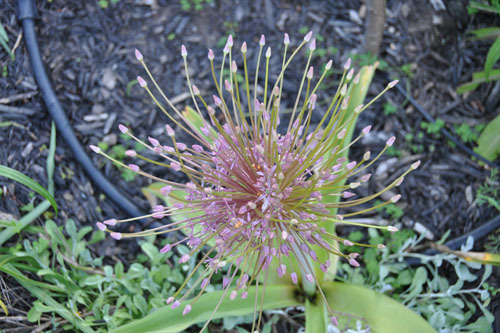 Hey, the Allium schubertii are blooming. They definitely add some drama to the swath bed. 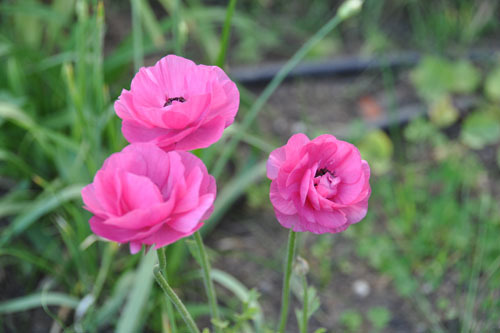 Off in the back garden, this has not been a great year for ranunculus. I'm not sure why, but the older plants never came up (or maybe just haven't come up yet?) and the newer ones are smallish. But still pretty. 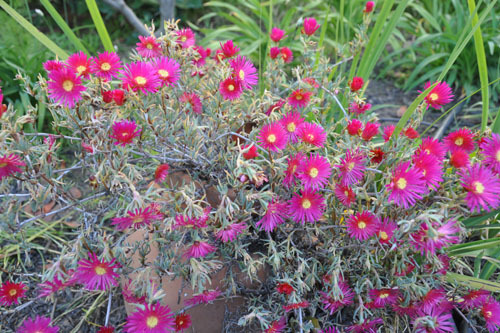 There's one bed in the garden that appears to be the Hot Pink bed, with those ranunculus and this Lampranthus 'Hot Flash'. Hot Flash is right, the thing fairly glows (until the sun sets, when it closes its flowers for the night). Also out back I have this Graptopetalum paraguayense 'Pinky', which I have growing in a strawberry pot. It has definitely outgrown the container, but I'm not sure I want much more of it. 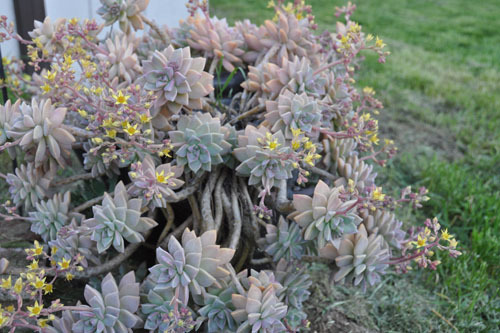 It's a lovely plant, but I think it would tend to take over if given free reign. Until recently it has been sitting in a wheelbarrow to make it easier to move around for mowing, and I liked having it up high. I think I need to get it some kind of pedestal. And finally, a look at the front walk. 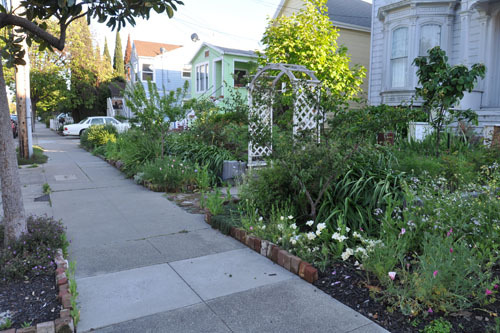 It's kind of amazing to me how close the current actual front walk is to the photoshopped version of it I used to plan the garden (which plan I almost immediately ignored). 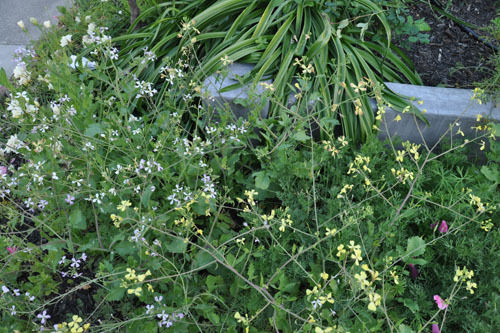 It looks like beach weed might be wild radish (Raphanus raphanistrum). What do you think? That is it! The seed pods confirmed it for me. Thanks! Those are gorgeous roses. I wish I cared as much about the overall look of my place. You know, new Labrador might be an apricot addict also. . . I'm hoping the bees fly back here to pollinate at least. 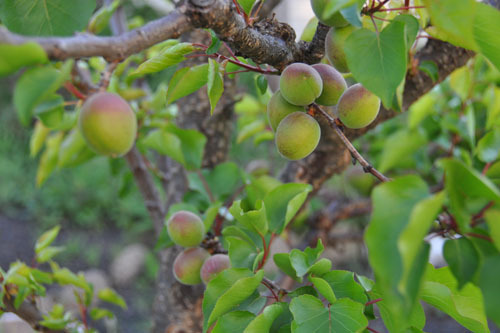 We're seeing plums and apricot babies all over, and promises of apples to come. . . What do you do for leaf curl? Normally for peach leaf curl I'd spray my precious hoard of copper sulfate on it, but this tree is out front by the storm drain, so no go (copper sulfate is bad for the bay). I guess I have to start reading up on the new treatments.